I saw this idea on Pinterest. I think it was actually a picture from a company that sells these on their website. I thought why buy them when I could just make them! These were a lot of fun to make. 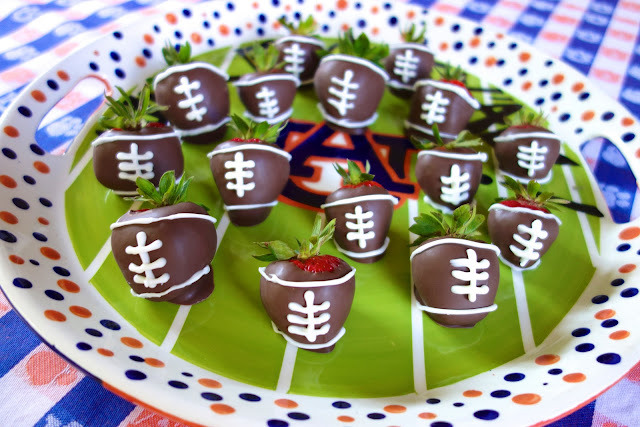 I used chocolate almond bark to dip the strawberries and some white candy melts for the stripes. The stripes were the most challenging part of this. 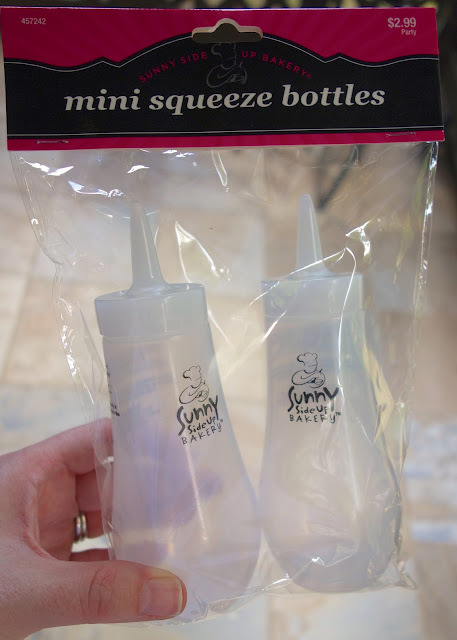 I found it is easiest to make the stripes with these squeeze bottles. You melt the candy melts right in the bottle. I found the bottles at Hobby Lobby, but I am sure they sell something similar at Michaels and Walmart. The strawberry footballs were a huge hit at our tailgating party. Everyone loved them! They tasted great and made a fantastic presentation! Wash and dry strawberries. The strawberries must be completely dry or the candy melts will seize. Melt chocolate almond bark according to package directions. 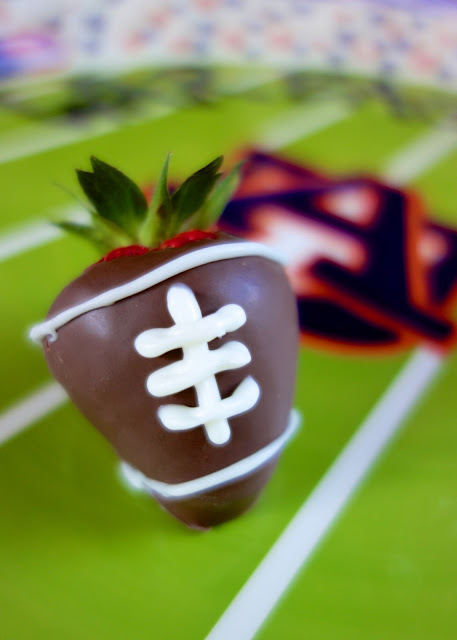 Dip strawberries into chocolate coating and place on wax paper to dry. Once the chocolate has dried, melt white candy melts in squeeze bottle according to directions. Carefully squeeze stripes on to strawberries. Allow to dry. Those are SO CUTE, Steph! Visually one of the cutest things you've ever posted. :-) Love. So cute! And perfect for tailgating. You are far better than I at making those lines so straight. Mine would be a mess! Cute! I use the Wilton squeeze bottles for decorating cookies, 2 bucks for 2 at Wal-mart. I tried these you have posted once and they didn't seem to work as well for me, but that was probably operator error! It's weird but just talking about those squeeze bottles gets me excited to make Christmas cookies! I need to get me some of those bottles! These are so cute! Cute! I'll try this! I love your blog and have been a follower for a while now - But your ads - recipe makers all over both sides, moving, blinky things at the top,etc that your blog is hard for me to read any more. It is very distracting. Not sure if anyone else had this problem. you sooooooo rock! I was thinking what could i make for my sons coach. this is perfect! thanks for the idea!!! Those are really so freaking cute! I just bet they were a hit!